At this moment in UK history, more money is needed to fund the NHS, schools, roads, railways, airports and other national infrastructure, Trident, foreign aid — and to fund 500 million sterling worth of renovations to the House of Commons. Money is certainly the problem, as more money would solve all of those issues and many more. Unfortunately, some governments ‘rob Peter to pay Paul’ but with little change in the total amount of revenue actually collected by the government. In some cases, a socialist (Labour) government will raise more revenue by raising taxes. Let the wailing begin! In other cases, a conservative (Conservative and Unionist) government will cut expenditures via fiscal and budgetary belt-tightening. Groan! Which is why governments everywhere are always on the hunt for more money. But are they? Are they really on the hunt for money? Are they really trying to increase revenue? Or do they automatically hit their default mode every time a budget crisis looms? Some observers think that governments dismiss attempts to increase revenue via increased trade with other nations too quickly and move to their particular default mode. Where Could the UK Find 1.3 Billion Consumers Wanting to Buy British Goods? Well, India, for one. And they’re a Commonwealth nation. Ta-Da! See? It’s sooo simple. All the UK government must do is to reach out to India’s leaders (especially post-Brexit, but nothing stopping them from getting started now!) in the interests of ramping-up trade by at least one order of magnitude. Why should India purchase trillions of rupees worth of goods from non-Commonwealth nations when they could purchase them from the UK? Why does India purchase their aircraft carriers from Russia, their fighter-bombers from Russia, other significant navy ships from Russia, and billions worth of goods from China, the southeast Asian nations, and the United States? A century ago, Great Britain’s trade relations with India were booming. Shipyards couldn’t build ships fast enough to keep up with the annual increase in trade. Heads should roll for allowing that relationship to falter — a relationship of prime importance to both the UK and to India! Never Mind Playing the ‘Blame Game’ There’s No Time! 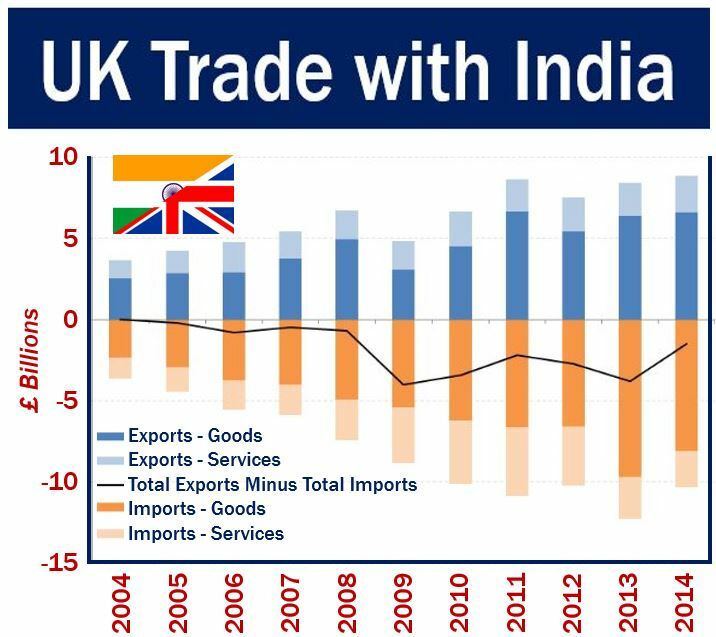 Instead of UK government departments fighting each other for funding, the government should work to ramp-up trade with India to increase Britain’s GDP by 5 per cent. We need to get a piece of that rapidly growing and rapidly modernizing economy, and thereby add five per cent to Britain’s annual GDP. Yes! More money will solve all of Britain’s spending problems… but it isn’t going to fall out of the sky and land in the Treasury building by itself! Someone! Anyone! Perhaps the Prime Minister or the Foreign and Commonwealth Secretary (or both) along with the Queen should invite Prime Minister Modi of India and his high officials to London, for an unprecedented and long overdue re-look at the macro relationship between the two countries to see how increased trade could improve the economies of both nations, and how each nation can play to their own strengths and work to offset each other’s weaknesses. Companies fight over ‘market share’ because that’s what companies do. And it is often a vicious competition. However, governments have an unparalleled advantage here because they can increase the overall size of the market — which, using this metaphor, relates to UK GDP. By dramatically ramping-up trade with India the government could increase GDP by five per cent, easily meet the spending requirements of all departments and still have the economic clout to run balanced budgets indefinitely. This so badly needs to be done that Brexit is a side-show by comparison, although without Brexit it would be difficult to enter into new trade arrangements with any non-EU country. In summary, Brexit is merely the means to an end — an end with a much stronger economy for both Britain and India, and a stronger Commonwealth partnership. Prime Minister Theresa May tells her audience about her party’s manifesto 20-days ahead of the June 8th general election, and starts off by saying, “Today as we face this critical election for our country, I launch my manifesto for Britain’s future. “A manifesto to see us through Brexit and beyond. A plan for a stronger, fairer and more prosperous Britain. A plan to seize the opportunities ahead and a plan to build a country that our children and grandchildren are proud to call home. “It is a detailed programme for government rooted in the hopes and aspirations of ordinary working people across the land. “But it is more than that, it is a vision for Britain, a portrait of the kind of country I want this nation to be after Brexit, as we chart our own way in the world. “For at this defining moment for the United Kingdom, as we embark on our momentous journey for our nation we have a chance to step back and ask ourselves, ‘What kind of country we want to build together’. So, without further ado, here is Prime Minister Theresa May’s entire Conservative Manifesto launch speech that was delivered in Halifax, West Yorkshire on May 18, 2017. Most of the deaths occur in Europe where diesel cars are popular and are the primary source of particulate matter (soot) and oxides of nitrogen (NOx). In China and India the proportion of diesel cars and trucks differs and emission standards are lower, consequently, diesel trucks are the largest contributors to particulate and NOx emissions. Due to strict emission standards that were enacted since 1999, diesel engines built in 2017 (and the diesel fuel itself) are orders of magnitude cleaner than in the pre-2017 timeframe. Yet, in the absence of incredibly strict diesel vehicle emissions standards for the future many more people could die prematurely from diesel-fueled vehicle exhaust due to a number of related factors. The huge baby boom demographic in Western nations show an increasing trend to higher rates of respiratory illness as they age, for one example. No matter who wins the UK June 8th election there are really only three choices on this file — four choices, if you include ‘Doing Nothing’ which really isn’t an option for a responsible government. Ban all diesel fuel sales in the UK by 2020. Yes, this would cause a paradigm shift in vehicle engine choices — and result in mass sales of used diesel engine vehicles to the continent before diesel vehicles are banned. Ban the use of diesel fuel for motive power within all UK cities. But not the carrying of diesel fuel because some vehicles are diesel/electric and can be switched manually between diesel and electric mode. Ban the use of diesel fuel for motive power in UK cities with more than 1 million residents. Pollution levels are noticeably higher in major centres, smaller cities may notice a daytime spike, followed by an evening clearing of the noxious emissions. Do nothing. At this point, even considering such a plan is beyond irresponsible, now that the facts are coming out and each new study on the subject turns out to be more incriminating (for diesel emissions) than the one that preceded it. Certainly it will take some effort by the government. But in this case, there simply isn’t any alternative. Something must be done to save the lives of thousands of Britons annually. Past 2020, more UK citizens will be dying prematurely from air pollution annually, than were dying during The Blitz annually — but with no end in sight if new regulations aren’t quickly legislated. The payoff is that the NHS will begin saving hundreds of thousands of pounds per month even in the first year — and every subsequent year will improve on those stats. And UK citizens and non-citizen residents will live healthier, happier, and more productive lives. I respectfully urge the Prime Minister to make it a priority. Lives are at stake!